"Avengers" star Tom Hiddleston is ready to team up with Benedict Cumberbatch at Marvel Studios. During an interview with Daily News, Hiddleston discussed his friendship with Cumberbatch and said he'd love for Loki and Dr. Strange to share the screen. "In some hypothetical world, I don't quite know when, for Loki and Dr. 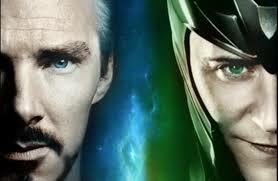 Strange to share the same frame would be very exciting indeed," Hiddleston said. "Because Benedict Cumberbatch is an old friend. So I would think it would be interesting to see who would get the upper hand." "Truthfully, I do actually know at the moment how many more times I'm going to play Loki, but I'm not going to tell you," he added. "It's not personal. It's just keeping it fresh for all paying customers to enjoy their films."